TV show dates: July 31, 2017 — August 21, 2017. Performers include: Reporters Charlie D’Agata, Adam Yamaguchi, and Vladimir Duthiers, as well as other CBS news correspondents. 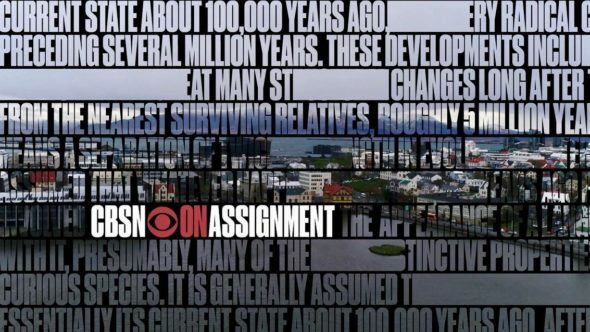 A primetime, summer news magazine series, the CBSN: On Assignment TV show features reports from new perspectives on stories from around the globe. The series is also available on CBSN, the Tiffany network’s streaming news platform. Viewers can also stream it on the CBS News website, as well as the network’s paid subscription streaming service, CBS All Access. Each episode features multiple reports. Topics include grassroots movements to end inner-city gun violence, political corruption, and new terrorist threats. In the series premiere, reports include a dispatch from Mosul, Iraq, about how ISIS has indoctrinated a whole new generation of children. The segment includes interviews with a worried mother, as well as aid workers in dire need of assistance. Reporting from Japan, the series explores the culture’s unique response to a declining population, as well as how the issue is affecting everyday life. Some people are now using eerily realistic robots as friends and roommates. Meanwhile, schools are closing, because there are not enough students to justify keeping them open. From Europe comes a report regarding how foreign contractors are committing visa fraud to expand automobile factories in the USA. CBS News correspondent Reena Ninan goes to the front line of cyber warfare – the nation’s hospitals. The broadcast also explores the life-and-death job of journalists in Mexico and how beautiful islands are being lost because of climate change. Ninan investigates the growing number of cyberattacks on hospitals around the country, where, if successful, hackers can hold hostage some of America’s most vulnerable residents. It’s a battle not fought in the emergency department, but one that could render them inoperable in a crisis. Ninan also travels to India and talks with some of the “white-hat” hackers trying to keep American companies and your personal information safe. From Mexico, Manuel Bojorquez looks at the staggering number of journalists being gunned down by drug gangs across the country as the cartel war escalates. Bojorquez embeds with the many reporters risking their lives to bring the truth about this violence and government corruption to the world. First aired: August 21, 2017. What do you think? Do you like the CBSN: On Assignment TV series? Should this TV show have been cancelled or renewed for a second season on CBS?